3M Artillery Earmuffs H7B GN are neckband style (aka behind-the-neck) hearing protection earmuffs designed for tactical specialists. The ear cups are soft and wide to provide a comfortable fit and a good seal against noise. The neckband design makes these ear muffs fit very comfortably when worn with a wide range of hats and helmets, including most current protective combat helmets used by the U.S. Military (ACH included). The wearer's helmet does not have to be taken off in order to put on or remove these ear muffs, saving time. Provides good NRR 26 hearing protection for high-noise environments. 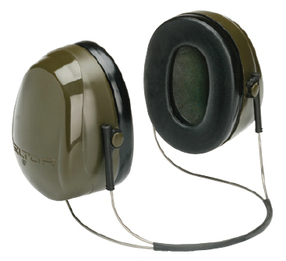 Intended for Artillery Teams who require dual hearing protection, wearing a pair of ear plugs (not included) underneath these earmuffs will provide complete artillery hearing protection as recommended by current weapon systems manuals.